‘‘At the least be accommodative, don’t cause gender harm in any of your research or development interventions….,’’ said Dr Maureen Miruka, Team Leader of the Pathways program at CARE USA. She was speaking as guest speaker at the 3rd Gender Forum Meeting that was facilitated from ICRISAT-Nairobi, on 30th July 2014. Maureen was sharing with the ICRISAT research fraternity from all locations, the process CARE has followed and the gains they have made in a 4.5-year learning grant from the Bill & Melinda Gates Foundation to empower women in equitable agricultural systems at scale and contribute to women-responsive agriculture programming. The program’s work is implemented in Bangladesh and India in South Asia, Malawi and Tanzania in ESA and Mali and Ghana in WCA; geographies that are also target countries in ICRISAT’s research agenda. CARE in its Women’s Empowerment Framework defines empowerment as the sum total of changes needed for a woman to realize her full human rights – the interplay of changes in, Agency: her own aspirations and capabilities; Structure: the environment that surrounds and conditions her choices; and Relations: the power relations through which she negotiates her path. Most significantly, this framework entails challenging norms (which are considered to be structures) and not just building individual skills and capacity; it recognizes gender as relational, and recognizes institutions (structures) as gendered. Under this Framework, the Pathways program is grounded on a theory of change (TOC) identifying 5 key change levers including: improved capacity and skills, enhanced access to productive resources, increased productivity and profitability, household influence and an enabling environment. Farmer Field and Business School (FFBS) - an integrated approach that covers agriculture, markets, gender, nutrition and M&E - was developed by the program to deliver on this TOC. Under the gender technical component, the program focusses on household decision-making, (focusing on contributions that women make to household income streams and their lack of control over financial decisions) and workload sharing and benefit sharing (working with men to normalize involvement of men in care giving and workload sharing, daily time use and harmony in the home). In discussing gender integration into the FFBS rural communities in different countries developed different analogies. Diagrammatically, communities in Tanzania identified ‘gender and gender relations’ as the fulcrum of the wheelbarrow that facilitates movement of livelihood activities while in Malawi, it was identified as the bicycle chain that ensures the other parts move. The other parts of the wheelbarrow or the bicycle were identified as key ‘levers of change’ for attaining development outcomes. These community discussions then become important platforms for having gender dialogues with individuals in households, groups (collectives) and thought leaders (religious and civil leaders) in the communities; at critical times of the seasons to tackle issues like land access, workload sharing, participation in markets and sharing of benefits. These dialogues become an avenue for identifying the ‘gender exploitative practices’ that are considered ‘normal’ according to the culture and practices of the communities; that sometimes even the scientists and development agents take advantage of as they implement their research or development activities with community members. 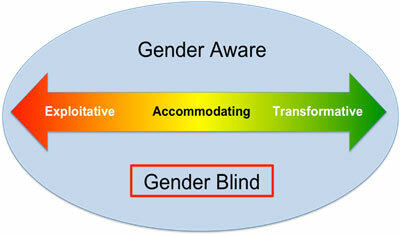 Having the gender dialogues around such practices, learning to identify them, and challenging them, is what Maureen said is one way of moving the gender continuum bar from exploitative, to accommodative or better to transformative approaches, as illustrated by the figure 1. Pathways program has gone ahead to develop an FFBS toolkit that includes a set of gender tools to facilitate specific dialogues. This toolkit is a work in progress but available for practitioners such as ICRISAT that wish to implement gender dialogues. Since gender and gender relations differ from country to country, the tools are contextualized. The Program has a robust M&E framework with indicators around gender and uses both quantitative and qualitative methods for data collection and analysis. More specifically, they have just conducted a qualitative mid-term review to capture gender related impacts at household and community levels. Initial results indicate that the gender dialogues are leading to gender transformational change. Key policy outcomes are improvements in land access to women farmers in Ghana, Tanzania and Mali. 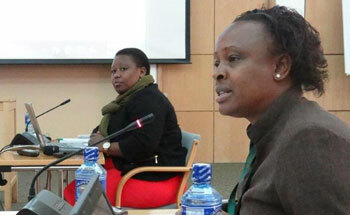 Esther Njuguna, the Gender Specialist in ESA urged ICRISAT’s gender specialists and scientists to answer these questions and to identify the comparative advantage ICRISAT gender research can focus on. In his opening remarks, Alastair had said, although many don’t have much experience in applying gender tools and concepts in our work, we can learn by doing and learning from those who have ideas and tools that can hopefully help us apply and mainstream gender in our work’.